Last night i saw The Hurt Locker and i have to say that it is a great film. It’s a great story about a man, William James (Jeremy Renner), who diffuses bombs i n Iraq under enemy fire. It’s an absurdly dangerous job and he rellishes in it. The movie starts with a quote, “War is a drug” and it couldn’t be more true for William James. You could view William as a type of artist for he approaches a Flow-like state when he’s diffusing – all time stands still and like a surgeon he achieves the utmost clarity and focus. 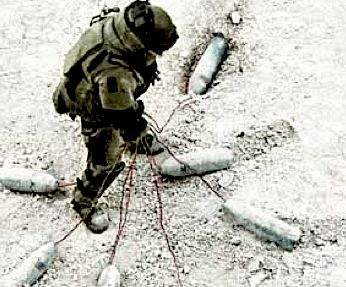 He understands bombs inside and out and does it day after day after day until he could do it in his sleep. He also tries to understand the bombers. He loves his job and could be the best in the military at it. I thought that this was the first good film about the Iraq War that i’ve seen. It shows how the troops are integrated in the streets and how tough it is for them to police in a city that doesn’t necessarily want them nor understands them. I’ve talked to a few veterans and one of them has specifically mentioned the kids in the cities and how hard it is to look at someone and both want to help someone and also be afraid of them killing you. we saw this last night and i also thought it was brilliant.i really agree with this: “There weren’t lame quick cuts in the action scenes but rather the camera dwells on the situation at hand and allows the viewer to experience the situation just as the soldiers are. It’s not action – it’s suspense.” it felt very un-hollywood and real. all except the last ten minutes. i thought flashing to the a little too polished hollywood wife and then the loud music when he's back at war made it too much like a video. in another movie, i might not have noticed, but the rest of it was so good and so realistic that i thought the ending wasn't up to par with the rest of the movie. that said, it was still a really great film. i think she deserves best director award and some best actor awards should come out of it too.